A hands-on practical sushi making class, first of all you will make the proper sushi rice, then making your own sushi and sashimi! Price includes all ingredients, printed recipes and a delicious meal at the end of the class. Join our hands-on practical sushi making class with Sushi Made Simple cookbook author, Atsuko! 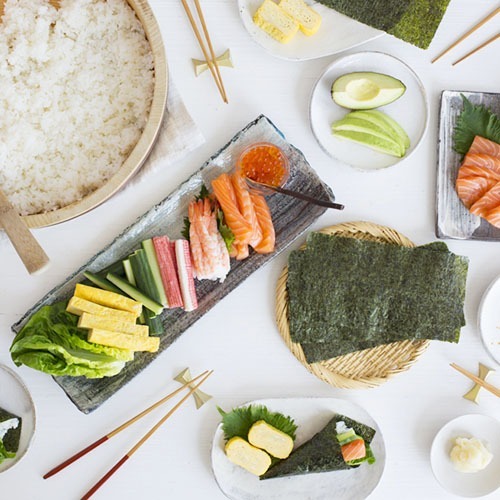 First of all you will make the proper sushi rice, then making your own rolled sushi with favourite fillings, such as salmon sashimi with avocado, spicy tuna with avocado or watercress with beef steak and wasabi! there is a plenty of creative styles of rolls you can try to make in this session. One more fun for you would be making an egg roll with using a square frying pan! We provide fine quality Japanese products and sashimi quality fish as always. Atsuko’s signed brand-new cookbook “Sushi Made Simple” will be available to purchase in this class. Also you will lean how to source the fish fillet for your sushi and the hints of making some rolls suitable for your sushi party! *There will be the alternatives for vegans or vegetarians. Please let us know your dietary requirements in advance. We start with introducing a variety of sushi, then a cooking session. Next you will make your own sushi and finally eating what you made! The class will take 3 hours. If you hold multiple vouchers for single classes please book one class at the time. Q. I would like to book a class as a gift for someone – is this possible? Yes, you can book either an individual space in a group session, or a private lesson. Please contact us for availability. Q. If I wish to cancel my booking, how does it work ? Bookings cancelled more than 14 days prior to the start of a course will be refunded. Alternatively you may transfer to another date free of charge. Bookings cancelled within 14 days of the start of a course are non-refundable and non-transferable, the only exception being if we are able to refill your place. If we are able to do so a full refund will be given, or you may transfer to another date. Refunds cannot be issued on any unattended classes without prior notice. Our Terms and Conditions. Q. Do you have vegetarian dishes available? Yes – When there is a mixed class, we will cook vegetarian dishes separately. Please advise us of your food preferences when you book the course. There are many vegan/vegetarian dishes that use soy product in place of meat or fish – this type of cooking is called Syojin Ryouri. Q. I would like to arrange a special event for a group. Is this possible? Yes – if you are planning for a surprise birthday party, team/corporate event, social occasion or celebration, we will bespoke your special cooking event! You can choose to hold your event at ‘The Grocery’ or in your own venue. Please contact us for pricing based on numbers.